Gladiator tops Ryan Martin’s favorite movie list. “I love watching something that’s epic,” the UCSB track athlete said. Three weeks ago, Martin concocted an epic of his own. His victory in the 800-meter run at the Big West Championships made a huge splash in publications and Web sites devoted to the sport. It’s on the cover of the July issue of Track & Field News: a full-page photo of Martin churning alongside UC Irvine’s theatrically named Charles Jock. He passed Jock, the defending champion, in the last strides before the finish line. “My training program with Pete [Dolan, the UCSB track coach] has me peaking at the end of the year,” Martin said. “It’s worked out perfectly so far.” A year ago, after Jock bested him in the conference meet, Martin went on to finish fourth in the NCAA Championships, where he posted his previous best time of 1:46.71. “I kind of came out of nowhere,” said Martin, known to his Gaucho teammates as Rymar. He still was a somewhat forgotten man this season, until the Big West final. He will be readily recognized at the NCAA meet this week (June 8-11) in Des Moines, Iowa. 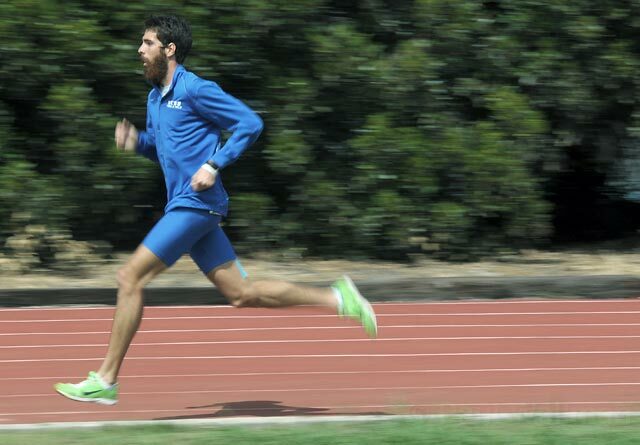 He is the only UCSB athlete in the competition, and he has a flourishing beard. The men’s 800 should be a highlight of the NCAA meet at Drake Stadium. “I’m out to win it,” Martin said, but he’ll have plenty of competition. Besides Jock, he mentioned Robby Andrews of Virginia, Fred Samoei of Alabama, and Cory Primm of UCLA. “They all have to be thinking they can win, too,” he said. The 6’1” Martin has a lanky build but is blessed with leg speed. “I ran a lot of sprints in high school to score points in dual meets,” he said. Although the 800 is too far to run all-out, it verges on a sprint for two laps. “It’s the fastest race that’s not in lanes all the way,” Martin said. “You can see the runners battling it out.” Like gladiators. STATE STREET MILE: Almost 300 runners battled the elements in the Platinum Performance State Street Mile. “It was the strongest wind I’ve run into,” said Christian Hesch, winner of the men’s elite race on a stormy Sunday morning. Hesch’s time was 4:03. The 32-year-old Hollywood resident broke four minutes when he won the downhill race in 2002 and ’03. Bethany Nickless, a former UCSB runner and now assistant coach, was the women’s elite winner in 4:49. MAGICAL WEEKEND: Three-fourths of San Marcos High’s 4×400 girls’ relay team prepared for State Track & Field Championships by pulling an all-nighter at Disneyland. “I wanted them to enjoy their graduation night,” Royals coach Marilyn Hantgin said. Hanna McDaniel, Marie Brashears, and Elysia Hodges slept in the van after Hantgin picked them up Friday morning at the Magic Kingdom. The coach had begun the trek at 4:30 a.m. in Santa Barbara with junior Kaylin Koopmans, the fourth member of the team. They competed that evening in the preliminaries at Buchanan High in Clovis and qualified for the final. On Saturday night, they ran their hearts out and finished third in 3:46.89—almost eight seconds faster than the school record at the start of the season. “It was a fairy-tale ending,” Hantgin said. Nicholas Scarvelis of Dos Pueblos won the boys’ shot put championship with a heave of 64 feet, and the UCLA-bound senior placed fifth in the discus throw (171’7”). McDaniel finished in a three-way tie for third in the girls’ high jump (5’4”). CHARGER CHAMPS: Dos Pueblos ended the school year with a CIF championship in softball. Junior pitcher Hannah Harris fired her fourth shutout of the postseason Saturday as the Chargers shackled Fontana Kaiser 5-0 in the Division 4 final at Irvine. It was DP’s second CIF team title of the year. The girls’ water polo team won its third consecutive Division 1 crown in February.